Healing from trauma begins with the courageous act of telling your story. Yet many survivors of trauma are afraid to tell anyone about their deeply painful and personal experience(s). Trauma survivors often feel shame, guilt, fear, and anger. They may also carry deep spiritual wounds, such as feeling abandoned or punished by God. They may wonder how they can ever trust God. 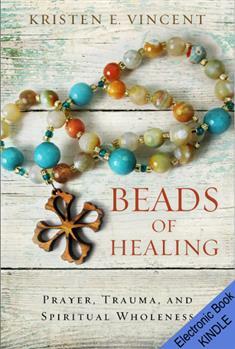 In Beads of Healing, Kristen Vincent shares her story of childhood trauma and how she eventually found God's peace, healing, and wholeness. She tells how, over 35 years after the trauma, she encountered God as never before in the presence of a Christian community. In this setting where she felt safe and loved, and through the help of spiritual practices like scripture reading, prayer, group sharing, and reflection, she finally found the peace she had been seeking since age 7. Vincent models how to name feelings of grief, anger, abandonment, shame, and fear. She gives readers ideas for ways to use prayer beads as a safe way to enter conversations with God, to talk honestly with their Creator, and open themselves to God's love. NOTE: The author recommends that readers study this book with someone: a therapist, pastor, spiritual director, or support group. Beads of Healing features a Leader's Guide with an outline for 16 sessions, links to instructions for making prayer beads, and a guide to using prayer beads. This book will be a valuable resource for pastors, counselors, and others who provide support for trauma survivors.